by Bill Dwight on Friday, September 06, 2013 at 4:55 PM | LEAVE A COMMENT! 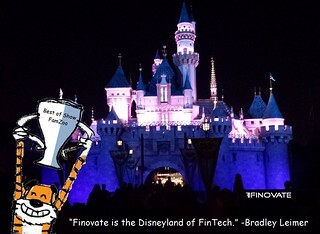 Finovate, the Leimer-dubbed Disneyland of Fintech, was the first demo-focused conference in financial technology. It’s now in its sixth year and going strong. Finovate issued their Second Quarter Report over the summer on the heels of the Spring 2013 show in San Francisco and leading up to the (sold out) Fall 2013 show in New York City. The report features FamZoo in the Best of Show section and includes the following interview with yours truly to discuss a few topics beyond what could be gleaned from our 7 minute demo. Q: Why did FamZoo win Best of Show? Relevance. Everyone in the audience can relate to the problem of teaching kids good money habits, either from the parent perspective, or the kid perspective, or both. The current economic environment only deepens that relevance and creates a sense of urgency in the minds of parents. Necessity. It’s pretty clear to most people that there’s a huge gap that needs to be filled between the piggy bank and traditional adult-centric banking products like checking accounts and credit cards. Kids need hands-on practice with money to hone their personal finance skills. Parents need some reasonable measure of control. Parents and kids need to work together as a family, rather than as individuals using separate products. FamZoo addresses these clear needs in a convenient way. Simplicity. Our new solution is a riff on two very well-understood products: the prepaid card and personal finance management. We’ve just tweaked and integrated the two in clever ways while mixing in a little of our own secret sauce (like automatic IOU tracking) to address the needs of families. Authenticity. FamZoo is a product my family uses every day. That’s why it’s so easy to demo. My demos always center around perusing the recent transaction histories of my family members and simply telling the real stories and financial lessons behind each. That makes the demo naturally authentic, casual, and invariably entertaining, since every family has its quirky moments, especially mine! Q: What would you like to add to what we’ve learned from FamZoo’s demo? Dwight: With a seven-minute demo format, you’re forced to keep things super focused and simple. So we pretty much stuck to reviewing items on the transaction history page and peeking at my son’s overall financial picture on the account-diagram page. We didn’t get a chance to show off just how much flexibility we provide when it comes to setting up your virtual family bank. Flexibility is crucial because we’ve come to appreciate how every family is different. Each has strongly held beliefs about what constitutes the right money values when it comes to earning, spending, saving, and giving. So, families need a rich toolbox of financial components— allowances, chore charts, compound interest, expense accounts, loans, savings goals, matching contributions, expense sharing, you name it—that they can easily mix and match to fit their unique situation. 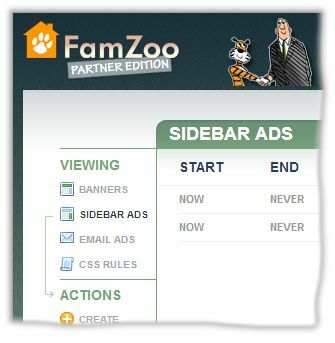 And finally, our partners need a lot of flexibility in how they present FamZoo to their audience. We provide a broad array of partnering options when it comes to co-branding, sponsoring family memberships, and revenue sharing. Our co-branding option includes a self-service administrative console for our partners where they can customize the look and feel, schedule targeted offers within the application, and monitor usage. Q. Any news to report about FamZoo since FinovateSpring? 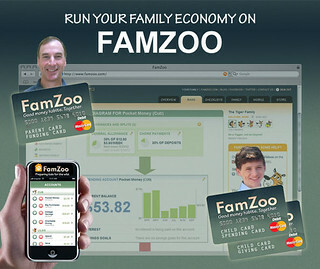 Dwight: The biggest news is: we started shipping our first family packs of prepaid cards to FamZoo.com families starting June 3, 2013. The intrepid Nakada family nabbed the distinction of being the very first FamZoo family to place an official production order. Woot! 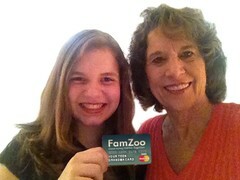 Any families who would like to join them as FamZoo cardholders can check out our FAQs. The next step? We’ll be rolling out co-branded family packs of prepaid cards through partner financial institutions like community banks and credit unions via TransCard’s Unlimited Family Banking solution. Q. Do you see the Prepaid Card Family Pack as a complement to or replacement of traditional banking for children? Dwight: I actually think it’s a little bit of both. That’s because there really aren’t any traditional banking products that conveniently model a “family economy” or a “virtual family banking system” the way we do. Traditional savings accounts for kids are pretty much out of sight, out of mind. Kids don’t interact with them on a day-to-day basis, and the interest rates are too paltry to create meaningful incentives. As for traditional checking accounts, they’re designed for adults, not kids. They don’t address the parent control, collaboration, and education angles. Checking accounts that allow for flexible sub-accounts come a bit closer, but they tend to be extremely minimalist when it comes to automating the workflows in a typical family economy—think job charts, allowance formulas with splits, reimbursements, informal loans, IOUs, and parent defined incentives like whopping interest rates or aggressive matching, just to name a few examples. And, on top of all that, FamZoo’s whole user experience is designed from the ground up around parent-child collaboration, education, and reinforcing good habits. So, our offering is complementary in the sense that it’s a gateway to traditional banking products: adults can connect their traditional account to their FamZoo funding card as a way to pump funds into their “family economy.” Kids can roll over accumulated funds from their FamZoo accounts to traditional banking and investment products like Roth IRAs or 529s, and ultimately, kids graduate from parent-moderated FamZoo accounts to traditional banking accounts once they become more independent. On the other hand, our offering is a replacement for those parents who are struggling to use traditional banking products for their young kids or teens and to manage a lot of their “family economy” by hand. That said, I prefer to think of our product more as an interim step rather than a long-term replacement. Q. In beta tests, what is the most interesting way you have seen the Prepaid Card Family Pack used? Dwight: One of the most interesting and inspiring scenarios I’ve seen so far is the grandmother who is sharing a FamZoo family pack with her two granddaughters. It’s a neat way for grandparents to create a regular touchpoint with their grandkids and maintain an ongoing dialog about smart money habits. It’s also natural for grandparents to place a particular emphasis on philanthropy. They can set up charitable giving cards for the grandkids and make aggressive matching contributions. Evaluating and selecting appropriate charitable organizations is a great opportunity for meaningful collaboration and sharing family wisdom across generations. Oh, and one amusing little side point: Do your kids have grandparents who love to spoil them with random, lavish spending sprees? You can replace those ad hoc bursts of money with a modest grandparent-funded allowance to introduce a nice dose of moderation. That way, you and the grandparents can stay on the same page when it comes to teaching your kids good money habits.